Home »Promote Yourself»What’s your leave-behind? Try a USB Flash Drive with your logo. You worked hard to get this meeting and you have been preparing like crazy for the presentation. You have a Powerpoint and a bunch of comps to show. After the meeting you want to leave print-outs and the files for the potential client to review on their own. Sure you could burn a CD/DVD as a leave-behind, but any 9-year old could do that. You want to do something that is as impressive as your presentation. What to do?? 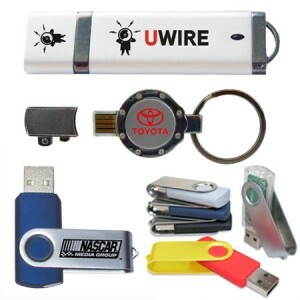 Try a USB Flash Drive with your company logo! Your average USB Flash Drive is treated like a commodity in China. Many companies manufacture the same exact drive to the same standard specs. As a result, prices keep coming down while the capacity keeps going up. This means more bang for your buck … if you shop around. Flash Drives are so simply to use that anyone can use them. They are very common in most offices. But, a Flash Drive with your logo sets it apart. It is also something that the potential client will keep because of the perceived value. And that means they will see your logo with every use. Even if they delete your files, your logo remains. Whereas a CD/DVD would just be filed or tossed. The look of the drive. After all, you want it to look impressive, not cheap. The capacity. As I mentioned, prices are always coming down. Prices start under $5 and increase based on capacity. Set-up charge and run charge. Compare prices carefully. Digital prints can have more than one color included for one set price. Pad prints/screen prints will charge per color and will also have a limit on the number of colors. Minimum quantity to order. The popular “swing” drives typically require a minimum quantity of 50. Other styles can go as low as 15 or 25. Let’s say you want to make a really BIG impression. How about a custom drive in the shape of your logo or some other related shape. It that case, you will also have a mold fee (approx. $150) as well as a 6-week wait. Pingline: great prices and service. CorporateKey: one of the best selections and the leader in custom shaped drives. So make sure that “leave-behind” is worth being left behind. ← Previous Previous post: Promote yourself with an email campaign. Next → Next post: Step-up Ring will save you from buying another set of filters.